I like eating a variety of breads – Indian Breads like Naan, Chappati, Millet Breads etc and non-Indian breads like crusty french bread, breakfast breads and others. 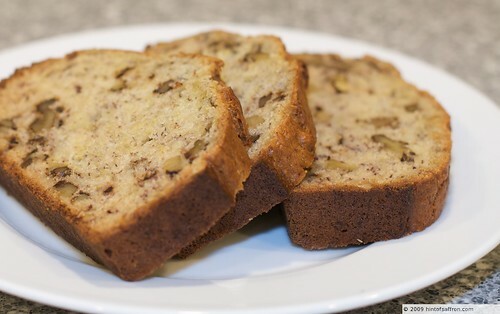 One of my favorite breads is Banana bread with walnuts or chocolate chips. So even though it is not really an Indian inspired recipe (the title of my blog notwithstanding), I wanted to post this recipe from a recent cookbook that I bought – America’s Test Kitchen. The recipes from that cookbook always come out really well without any modifications. Speaking of modifications, I have started exploring how I can make gluten-free of recipes that I really love. The reason for that, well read on…. Since the last couple of months my daughter has been suffering from itchy, scratchy skin. It has been the most frustrating last couple of months as we are trying to figure what was the cause of the issue. We tried all kinds of conventional, natural and homeopathic medicines and nothing seems to have cured her completely. One day my wife and I were discussing as to what changed and it just dawned on us that we had changed washing machines and bought the front loading washing machine. Not only does it use less water but if you use a short cycle, it does not totally take out the soap. Due to this, she started getting itchy and before we knew it developed into a full blown problem. Not only did we change the soap (we use Ecos now) that has the least amount of chemicals but we also wash the full cycle with extra rinse. That made a big difference. Another reason we found for her skin problems was that she is suddenly become gluten and dairy intolerant. That really complicates your life especially if we eat out. So we mostly have to cook at home since you have full control as to what you eat. Also, that drastically limits what you can eat or so I thought. There is an amazing amount of resources and recipes out there that are gluten-free and dairy free. So how does the banana bread fit into this story. Well, since Banana bread is my favorite recipe, I had to find a way to make both types of recipes – with and without gluten. Another reason is, my daughter said that since she cannot eat foods with gluten, we are not allowed to eat it either! That is when I decided to explore and cook gluten as well as gluten-free equivalent recipes. Since there is already an amazing amount of gluten-free recipe blogs and websites, I decided to to try to figure out how I can make gluten-free recipes for some of the dishes that I love. There is an amazing amount of Indian recipes that are gluten and dairy free but taste really really good. I will tag those as I go along. 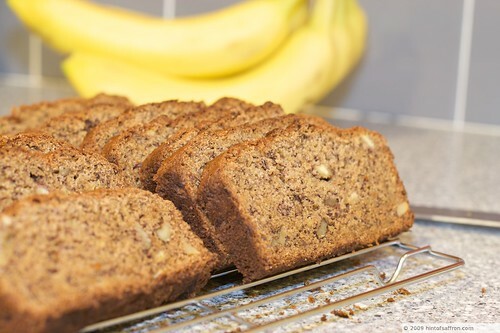 I have included the regular Banana bread recipe from The America’s Test Kitchen Family Cookbook . 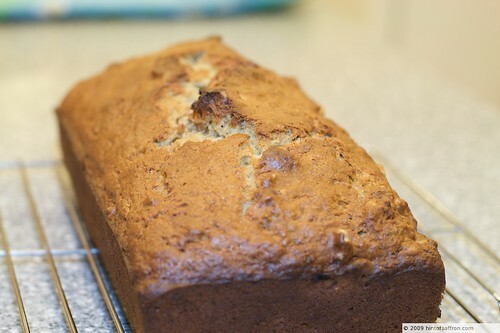 I made the gluten-free banana bread using the recipe featured here and it came out really good. 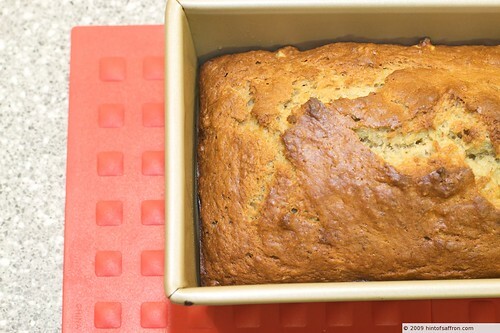 Since I always like to experiment and modify recipes, I am planning to modify the recipe and see if I can make a gluten-free banana bread that comes out tasting like the “real” one. This recipe was taken from America’s test kitchen cookbook and has been slightly modified by adding oat flour and wheat germ. The banana bread came out excellent. Feel free to substitute with chocolate chips if you do not like walnuts. Whisk the flours, wheat germ, sugar, baking soda and salt together in a large bowl. Whisk the mashed bananas, melted butter, eggs, yogurt and vanilla together in a separate bowl. Gently fold in the four mixture into the banana mixture with a rubber spatula until just combined. Add the nuts to the mixture. Try not to over-mix. The batter should lick thick and lumpy. Add the batter to the loaf pan and smooth the top. Bake until golden-brown. It should take about 55 minutes. Insert a tooth-pick and if it comes out almost clean, then it is done. Let the loaf cool in the pan for about 10 minutes or so. Then unmold onto a wire rack and let it cool for almost an hour.